The pattern should be easy to memorize so I don’t have to look at it all the time. The project should be easy to pick up and put down, even if I am in the middle of a row. The project should take long enough to knit that I will not finish it before I get home. The project should require only one or two skeins of yarn. In addition, I was looking for a project that would fit into one of the HPKCHC prompts for March. The Ancient Runes prompt was about Celtic runes and their connection to trees. One possibility was to craft a a project that represented one of the trees connected to the Celtic runes. Birch trees were on the list. This gets you to 5 stitches and on the front of the piece, so I picked up the pattern from row 1. 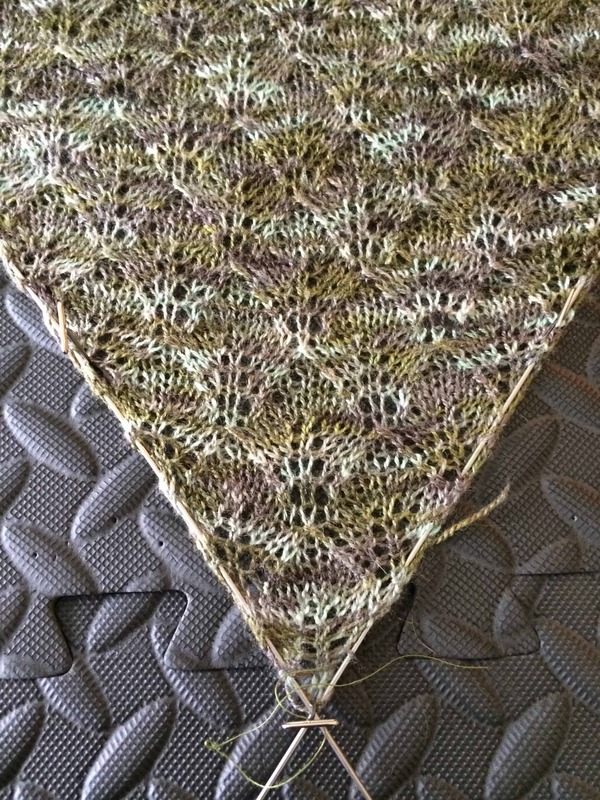 The only picture I have of the full shawl is the picture I took while it was blocking. The finished dimensions are approximately 54″ x 33″. 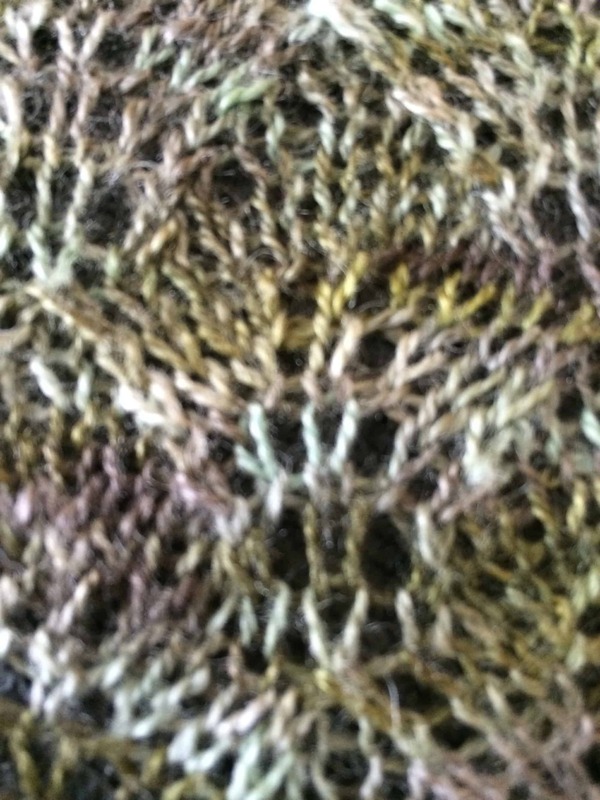 The yarn is Juniper Moon Farm Findley Dappled in the Frog’s Back colorway. I love the Findley Dappled yarn. I first found it when I went to Knit!, my local yarn store, looking for emergency yarn because I realized I did not have enough yarn to finish my Annis Shawl. Marney, the fabulous proprietor of the store, helped me find an appropriate yarn, which turned out to be Findley Dappled in Driftwood. I loved the yarn, and have picked up a couple other skeins since. The Frog’s Back skein is one I purchased at the 2013 Florida Fiber In from the Four Purls booth. As soon as I saw the colorway name, I knew I would buy it. I love tree frogs. We have them all around our house and every night we have them on the windows and sliding glass door. Once a year, the sliding glass door gets totally covered with little baby tree frogs. 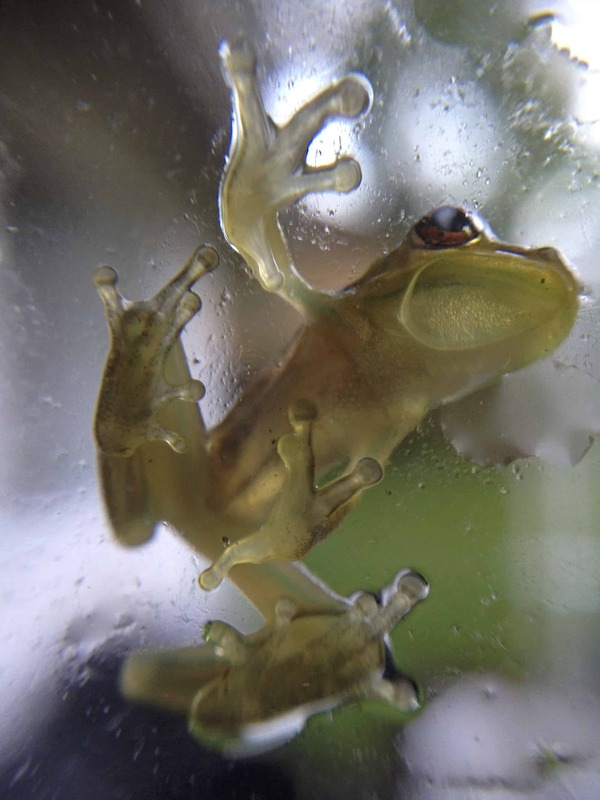 It is difficult to get a good picture of the tree frogs because they are usually out at night and the light reflects on the window. Here’s one I took a couple years ago, on a rainy day. I was inside the house, and this guy was on the outside of my sliding glass door. I took the picture using a macro lens on my iPhone. He was maybe 1/2″ long. The shawl took me longer to finish than I expected. I cast on March 17, hoping to have it finished by the end of March. I did not finish until April 30 because I have been having some issues with my right wrist. I was in a great deal of pain for about a week so could not knit at all, then took a self-imposed break for another couple weeks to let the wrist rest. I did turn the incomplete project in for partial points in HPKCHC. The shawl is now finished, just in time for me to bring it to Maryland Sheep and Wool!